July 4th, good times, family and food. Well, some good food…and some not so good. Yesterday, I was laying in bed watching the Today show and making a list of food that I wanted to cook up for the day. I wanted something “different”. 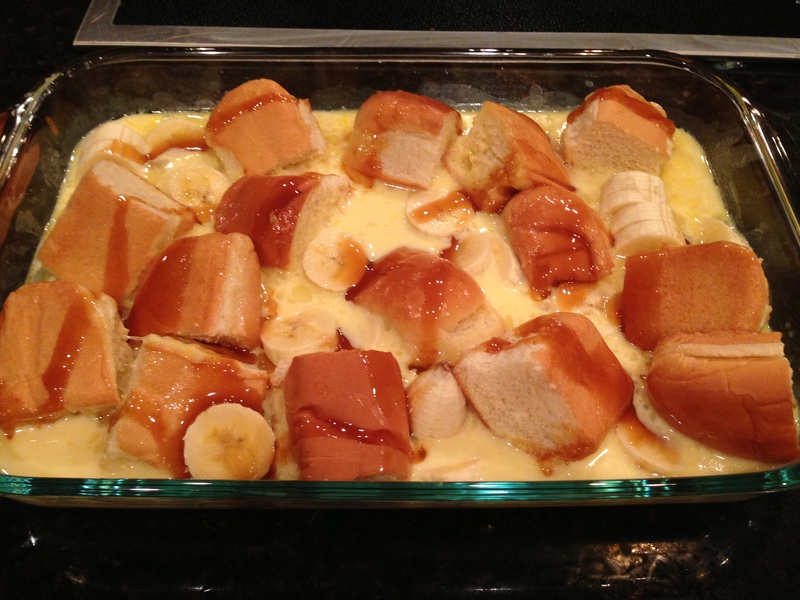 Oh good here comes the food segment, wowee… Campfire bread pudding with hot dogs buns! How absolutely festive, just like banana’s fosters but with hot dog buns! Fast forward to 10 o’clock at night which is the time that we actually got around to dessert. I don’t care if I am eatin’ this at midnight, I’m makin’ it. That may have been the alcohol talkin’ by the way. By this time the fire had long gone out and I decided I was going to make it in the oven, which the recipes says will work just fine. I can’t wait! I can’t wait. I can’t wait!! I put it in the oven and went in the bedroom to soak up some TV. I say to my husband, don’t let me go to sleep with that stuff in the oven. 30 mins later, I am suddenly awakened by my husband shouting, You got that stuff in the oven!! I jump out of bed and run to oven, smells delish! Lets do this! As I was dishing it out, I noticed that it looked rather INTER-esting. 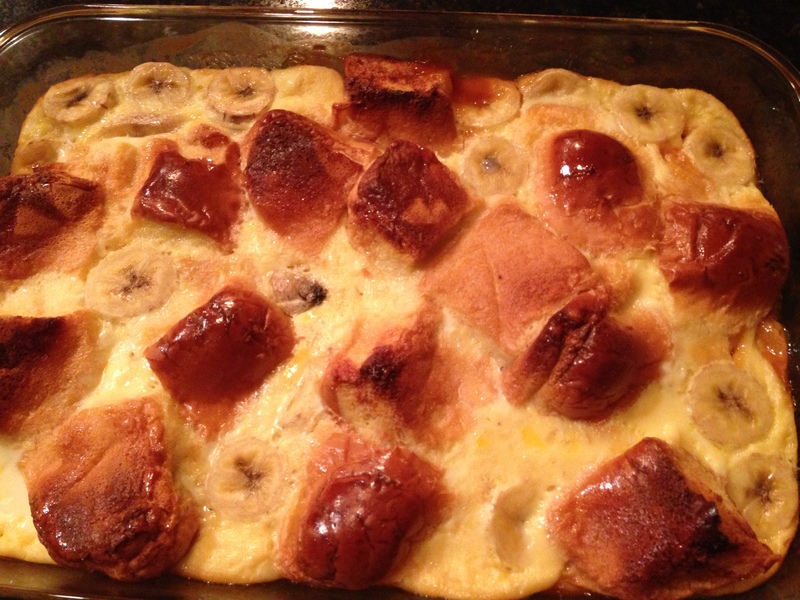 It has a super weird and totally unapplealing consistency, like syrupy mushy scrambledy eggs mixed with banana and bread lumps that were soft on the bottom and hard as rocks on the top. I think I saw it moving. I handed the plate to my husband without prior warning and we both cleaned our plates. The taste was actually pretty good, don’t think about it just eat it. When I got out of bed to take the plates back to the kitchen, my husband turned to me in all seriousness and said, “I hope this doesn’t kill me”. I say, “Yep, that was just icky”. I’m happy to say that we made it through unharmed, but the thought of the pudding has scarred me for life. Next July 4th I will be skipping the bread pudding and substituting plain ‘ole boring and predictably good and normal watermelon. Hope you had a great 4th! Latest Vintage Finds, Follow Me On Instagram! How To Buy Expensive Flank Steak! Lost and Found Smells… Le Couvent Des Minimes Honey and Shea! I’m A Million Dollar Mermaid, Ya’ll! Industrial Chic Lighting, On The Cheap!